Crow played both baseball and football in college and as a sophomore moved into the starting lineup as a defensive back and wingback on offense. He captained the team in 1954 and was chosen by the Cardinals in the second round of the 1955 NFL draft. A raw talent, Crow intercepted three passes during his rookie season. Cardinals went 7-5 to finish second in the NFL Eastern Conference while leading the league in interceptions (33). Crow was shifted to safety in 1957 and, while his interception total dropped to one, he was again a Pro Bowl selection. He was traded to the New York Giants and moved back to defensive halfback for the next three years, once again receiving Pro Bowl as well as second-team All-NFL honors from the New York Daily News in ’59. He was dealt to the Los Angeles Rams in 1961, where he played safety and eventually became a player/coach, getting by on savvy as his speed diminished. 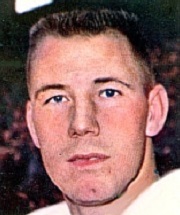 Overall in a ten-year career that ended in 1964, Crow intercepted 38 passes, 15 of which came with the Cards, and two of which he returned for touchdowns. He also recovered nine fumbles, one of which was run back for a 65-yard TD. Crow twice received second-team All-NFL recognition and was selected to three Pro Bowls. His brother Wayne was a halfback and punter in the AFL with Oakland and Buffalo.